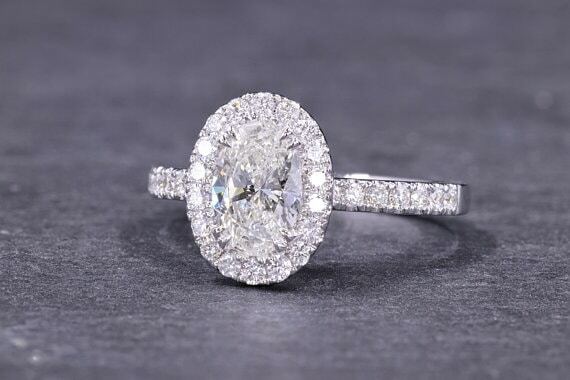 A classic halo ring setting is a ring that usually features a larger diamond or gemstone center encircled by a collection of round pave or micro pave (smaller) diamonds. 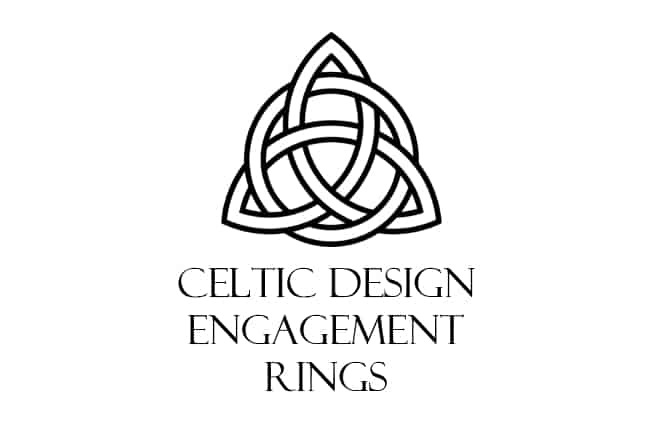 If you want more bang for your buck, I believe a halo ring setting is the way to go – it can give the illusion of a bigger center stone. 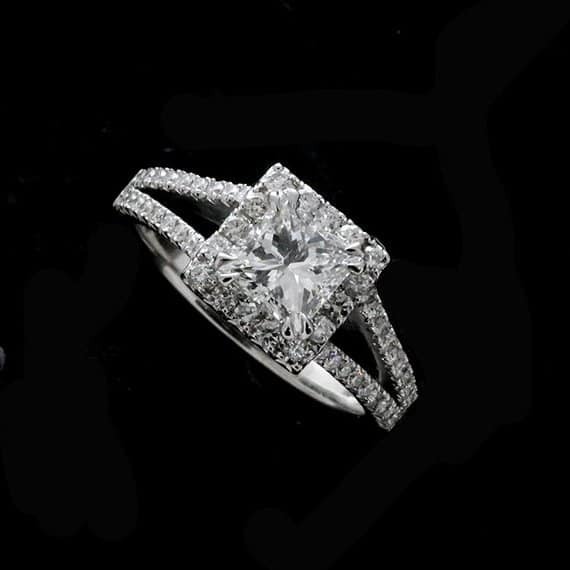 A quarter, third, or half-carat diamond center stone can appear as a half carat or larger because of the halo! 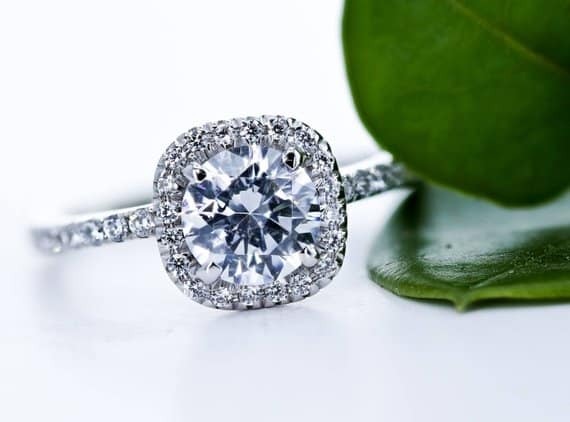 In this article we take a look at 7 examples of fabulous halo engagement ring settings including: floating, pear-shaped, cushion, princess, and oval. 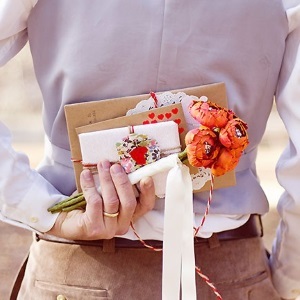 Are you into cheesy engagement stories? Scroll down the page to see my very own! 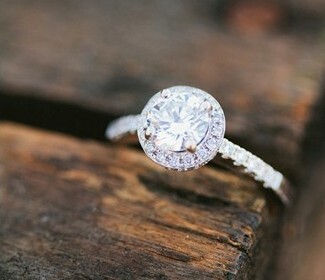 A heirloom halo ring like the one below is simply beautiful! It looks so much like the engagement ring on my finger. 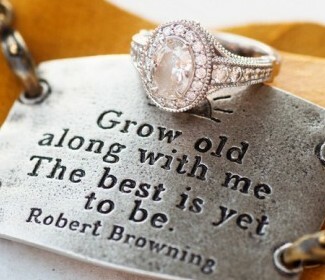 I love the vintage style and look that this ring gives off. If you read the full story below, you’ll know that I’m not a huge fan of a single solitaire diamond. 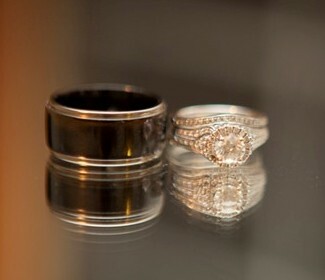 When I finally found a ring quite similar to the floating halo ring below, I knew it was my forever ring. 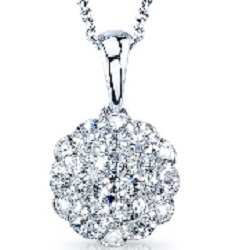 One downside that I will mention: be careful with all those small diamonds as there isn’t much holding them in place! One tiny diamond fell out of my ring not too long ago. I’m not even sure how, but I must have hit my ring on something resulting in a small diamond falling out. Luckily, I was able to have my jeweler replace the diamond with one from a ring that my grandmother owned. Now my ring is even more special to me with that added family connection. 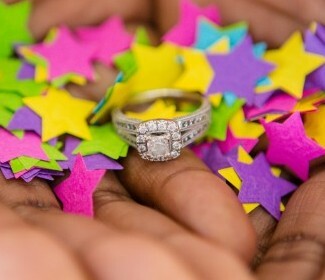 Ring inspiration and featured photo shoot at S’more Love Engagement Shoot. 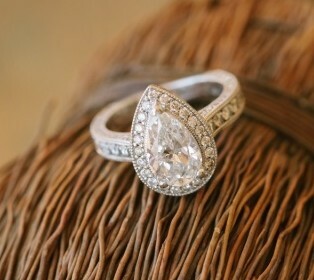 A pear shaped halo ring such as the one pictured is certainly a unique statement. 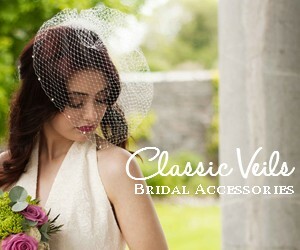 Real wedding photo taken from this simply stunning bohemian and rustic barn wedding. 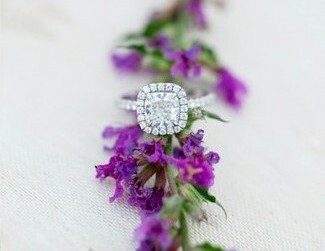 The Flora Vida engagment ring from Blue Nile is the closest match I could find to this unique halo ring below featured in an enchanting backyard wedding. 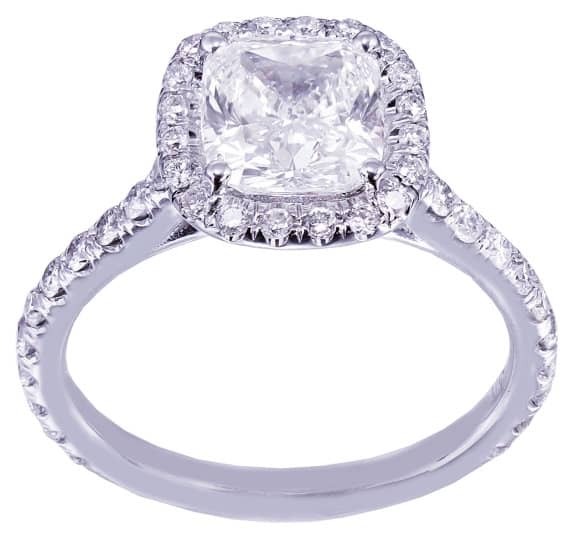 I am also a big fan of this ring – a cushion cut halo diamond ring with cushion cut center diamond! 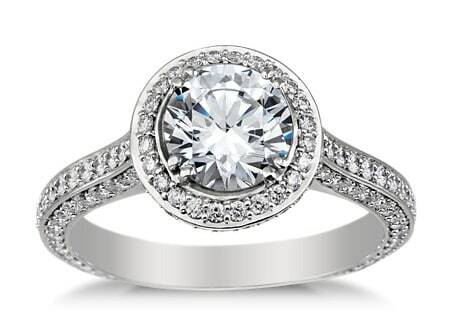 Similar to the ring above, this cushion halo engagement ring comes with a round center diamond instead. The title of this ring is quite a mouthful – a princess cut double halo diamond with split shank engagement ring. Try saying that three times fast! A lot of diamonds that some may find overwhelming. 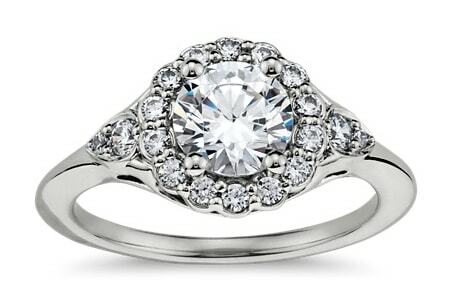 It has a certain regal look and appeal, which I could certainly wear on my finger. 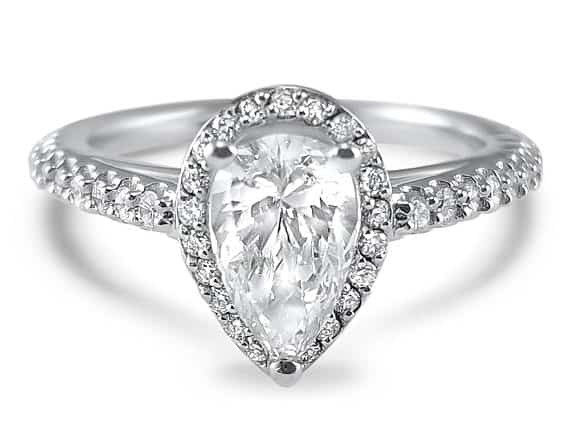 An elongated center oval diamond provides an elegant look and gives a lot of diamond for its size. When my husband (Andrew) proposed to me, it was very romantic on top of a tower in Florence, Italy. He popped the question with a lovely two carat fake rock he bought off Amazon. I’ll explain why in just a minute. Let’s just say he set the bar really high and made a monster out of his future diamond loving wife. 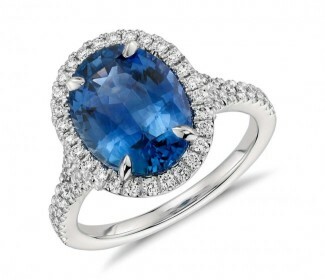 I’ll never forget about a year into our courtship Andrew asked me if I liked sapphires. 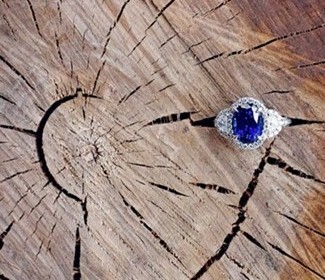 At the time I didn’t really know much about a sapphire, although I had a hunch it was similar to the big blue stone Kate Middleton wears on her finger. I ran back to a couple of my co-workers to analyze why he would have asked me that question. You get kinda crazy when you first start dating somebody, not to mention the years of being bombarded with diamond ring marketing jingles. Nonetheless, I knew that ‘a diamond is a girls best friend’ and this princess didn’t want no sapphire! Back to the story. Fast forward to our 5 week European vacation in 2013, with two of those weeks spent crossing the Atlantic Ocean on the Celebrity Silhouette. Andrew didn’t want to buy a real diamond ring because of the risk that it could get lost or stolen while in transit. I think that was a smart decision. There are enough unknowns when traveling, and having to look after a high priced piece of jewelry should not add to the stress while on vacation. The picture below is of my husband the night we got engaged. 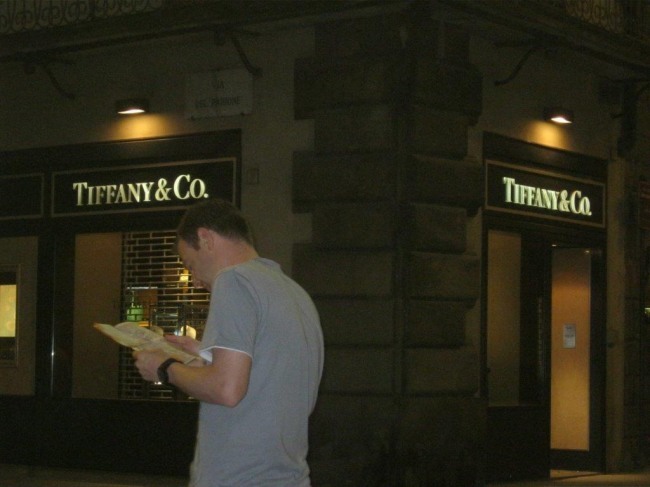 I don’t think he even knew that we were standing next to a Tiffany & Co. store, and I thought it was a perfect photo op. I still needed to a real ring after all! I still laugh to this day. I have to give him credit, it was not a sapphire or a dolphin shaped ring. We returned home to North America and made an appointment with my family’s jeweler in order to choose the halo engagement ring setting that we both loved and was within budget. That was very special to me. Sigh, it wasn’t a two carat rock like my fake Amazon ring, but it was pretty darn shiny! Growing up I was always drawn to a princess cut solitaire. 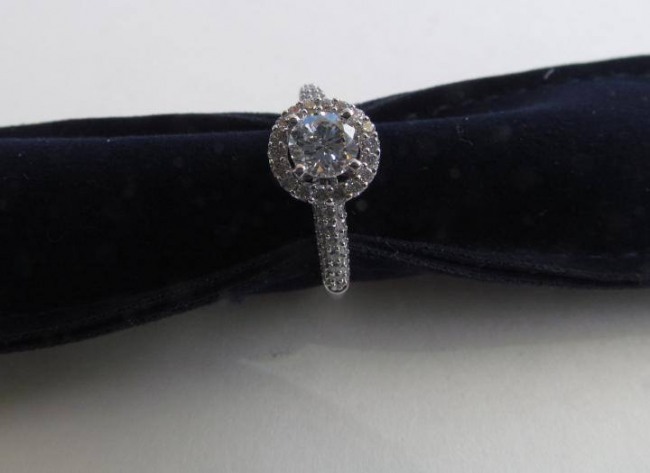 However, in recent years I have fallen hard for the vintage style of halo rings. 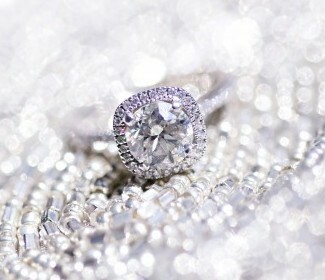 Below is a photo of the halo diamond engagement ring that I ultimately selected!